I first had contact with Jenn back in 2011 when she sent me a lovely email to tell me how much she enjoyed my novel, Three's a Crowd. She also revealed she was an aspiring author, and had recently landed herself an agent. 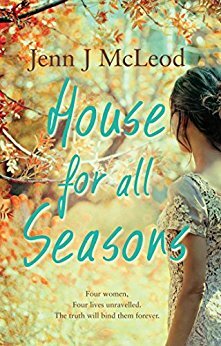 Fast forward to February 2012, when Jenn announced the exciting news that she had signed up with publishers Simon & Schuster, and just over a year later her debut novel A House for all Seasons hit the shelves, to resounding critical and reader acclaim. It's a lovely, heartwarming tale, just like its author, I suspect, because Jenn and I still haven't met in person! So I was thrilled to have her as my inaugural 'conversationee'. Hi Jenn, thanks for joining in the conversation today. As I said above, I’m thrilled to have you, because I’ve been dying to pick your brain about something. I am totally intrigued by the way you describe your writing process: that you come up with your title first, then the blurb for the back cover, and these then form the template for your novel … As someone who has been known to still be searching around for a title in the editing phase, and who struggles to write blurbs, this is absolutely fascinating. Can you tell me more? How did the title ‘House for all Seasons’ come to you? Ha! And the short answer? Rural romance was a boom genre around 2009 and although I'd been flogging a couple of manuscripts – they were not rural stories and I am neither a farm girl, nor a romance writer – and a significant birthday loomed, I gave myself an ultimatum. If I wasn't capable of writing a country story and getting 'some' attention by my 50th I clearly could NOT write and I should give up. (Hmmm, I did say this was the short version, didn't I?) Anyway, I decided to 'make' myself a country girl and write myself a good ol' country story. Enter NaNoWriMo 2009. (For those who don’t know, NaNoWriMo stands for National Novel Writing Month, which takes place in November each year.) Freshly inspired by two authors – Monica McInerney and yes, you, Dianne Blacklock! – I was determined to tackle a multiple POV (point of view) story about four women and written in fours parts: spring, summer, autumn and winter. (Let’s not take the easy path, Jenn!) Could I go wrong with an unexpected inheritance theme? No! So, House for all Seasons, with its four main female characters – each one as different as the seasons – was born. Before I jumped into Nano I had the title, the four characters, and I'd written their individual blurbs. Twelve months later, one day before my 50th birthday I submitted House and signed with an agent. And I'm delighted to say the same character blurb made it to the back cover of the printed novel. Amazing! Have you kept the same process for your next novels? This storm season, when a school reunion brings home more than memories, Calingarry Crossing’s local publican, Maggie Lindeman, discovers there's no keeping a lid on some secrets. I LOVE that opening line! It does exactly what an opening line should do, which is basically to make you want to keep reading. Well done you! Obviously your process is really working for you and the way you write stories. What’s next? You’ve hit on a really important part of the process here, Jenn – editing! I actually love the editing phase … Well, perhaps it might be better to call it a love/hate relationship. It can be a bit daunting at first, but it always leads to a better book in the end. I have learned so much from the privilege of having an editor. If there was one piece of advice I’d give to aspiring writers, it’s not to be afraid of being edited! What would your advice be, Jenn? It's never too early to start thinking like a published author. Give those closest to you the opportunity to share your journey. Don't assume they already know. Don't assume they don't want to understand. With involvement comes support – and you will need that in bucket-loads. That is such a great note to finish on, Jenn. So lovely chatting with you!